Our Rabbi, Eliana Jacobowitz, was appointed to the newly created position in 2010, following her rabbinic ordination from Hebrew College in Newton, where she also earned an MA in Judaic studies. Rabbi Eliana has been with our congregation since 2008 as our Education Director. Rabbi Eliana brings to Congregation B'nai Brith a wealth of knowledge and experience from a wide breadth of interests. Raised in a secular Israeli family, Rabbi Eliana first studied fashion design and attended law school at Tel Aviv University. She served in the Israeli Defense Forces during the first Gulf War in 1991. In the U.S., she earned a BA in history from Colorado University, and an MA in medieval history from Boston University. She edited the Hebrew translation of “These Are the Words,” by Arthur Green (Yediot Acharonot Press, 2008). At Congregation B'nai Brith, Rabbi Eliana initiated Friday evening services, which she co-leads with Seth Weiss. Rabbi Eliana's Kabbalat Shabbat service is infused with the warmth of singing. In her first year as rabbi, Rabbi Eliana created many community-oriented programs and services including the hugely popular family High Holiday service and a beginners Hebrew language class. Under her guidance, Congregation B'nai Brith is participating in several community-wide initiatives.Under Rabbi Eliana’s leadership the congregation children's school has revitalized and doubled its size. She has developed a curricula to match the program's diversity of students, and to reflect the values of the community. Somerville residents may have noticed Rabbi Eliana Jacobowitz's smiling face on the front cover of the Somerville Scout in January/February 2012. 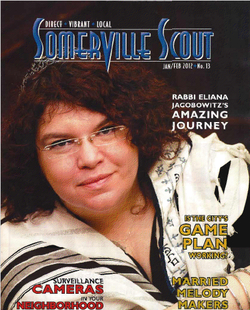 To download a copy of the article about Rabbi Eliana in the Somerville Scout, click below! Phil Weiss is Congregation B'nai Brith's Darshan (seeker, inquirer, explainer, i.e. religious leader). Phil accepted that role in 1985, after serving for two years as the congregation’s Baal Korei (Torah reader). A graduate of Columbia College, Phil earned his M.A. and Ph.D (in Philosophy) at S.U.N.Y Stony Brook. While attending Columbia, he took courses at the Jewish Theological Seminary of America, and he spent his junior year at the Hebrew University in Jerusalem, studying, primarily, Jewish philosophy and kabbalah. Phil is Adjunct Assistant Professor of Philosophy at Wheelock College, where he was a recipient of the Cynthia Longfellow Teaching Recognition Award. With Phil's help, Congregation B'nai Brith has been successful in preserving the traditional tone of its Jewish worship and ritual life, while at the same time evolving as an egalitarian, independent, democratic community that is welcoming to Jews from all walks of life and background. Phil brings to Congregation B'nai Brith the dual gifts of being an inspired teacher as well as a student of Jewish thought, ethics, and world religions. His d'vrei Torah (Torah talks), sprinkled with wit and humor, reflect his study of metaphysics and the philosophy of religion, his affinity for Plato, Emerson, Thoreau, Nietzsche, and Whitehead, and his love of Jewish texts. At Congregation B'nai Brith, Phil leads Shabbat and holiday services, as well as officiating at Jewish life cycle occasions. Phil also offers an assortment of adult education courses, and he leads a class on Tuesday afternoons for students approaching the age of Bar and Bat Mitvah. Four collections of his sermons for the Yamim Nora’im (Days of Awe) have been published by Congregation B'nai Brith: Awesome!, More Awe!, God-Awful!, and Awe Shucks! Dr. Phil Weiss officiating at an October 3, 2010 ceremony inaugurating Rabbi Eliana Jacobowitz as assistant rabbi. Congregants Adam Grossman and Ruth Grossman performed in the Kleiman sanctuary during the inauguration of Rabbi Eliana Jacobowitz as assistant rabbi of Temple B'nai Brith. ​On Sunday, October 3, 2010, more than 100 members and guests of Temple B'nai Brith filled the synagogue's sanctuary in a ceremony officiated by Phil Weiss inaugurating Rabbi Eliana Jacobowitz as the synagogue's new assistant rabbi. Jacobowitz, the synagogue's education director for the last two years, now serves as a spiritual and religious guide and teacher along with Weiss, who continues to serve as darshan. “This is an important milestone for Temple B'nai Brith as it continues to foster a strong and engaged Jewish community in Somerville” noted Lisa Andelman, co-chair of the inauguration committee who spoke at the festive gathering. With Jacobowitz's extensive rabbinic training, she is steeped in the Jewish discipline of Torah and finding meaning in creating community, Andelman said. ​Born and raised in Israel, Jacobowitz was ordained as a rabbi last May from Hebrew College in Newton, following five years of study and training. Jacobowitz, who will also continue as education director. ​“I wanted to be a part of a community that is excited about life and about living, a community that understands that life and living happen in the tension between past and future,” Jacobowitz said during her D'var Torah at the ceremony. In a letter to Jacobowitz for the inauguration, Mayor Joseph Curtatone wrote, “Your dedication to the congregation and the community is evident... I know that the B'nai Brith community is excited to continue to learn from you going forward,” he wrote. State Senator Patricia Jehlen and Representative Denise Provost attended the ceremony and presented Jacobowitz with a congratulatory citation from the state legislature, signed by Jehlen, Provost, and representatives Carl Scioritino, and Timothy Toomey. ​Another letter for the occasion was written by Barry Shrage, executive director of the Combined Jewish Philanthropies, greater Boston's leading Jewish organization. “Thanks to your vision and energy, Temple B'nai Brith is a true sacred community that is warm and diverse and inclusive, embracing all who are drawn to be part of the synagogue community,” Shrage wrote. Also in attendance to mark the occasion were Somerville Alderman William White; Rabbi Sharon Cohen-Anisfeld, dean of Hebrew College's rabbinical school, and Rabbi Allan Lehmann, associate dean; the Rev. Dr. William M. Kondrath, professor and Director of Theological Field Education at the Episcopal Divinity School; and Richard Murphy, executive director of Catholic Charities, next-door neighbors of the synagogue.